Have I become too personal in the article? When I went for a walk, the following points came into my mind. Please feel invited to supplement them with your own points and experiences and therefore, make them even more interesting for further readers. Thank you! 1. The bank is free of charge (… and this will continue)! The year 2016 is officially the year of fee increases at German banks! Many banks have increased the account management fees or implemented them again. Especially the savings banks and Volksbanks, but also the UniCredit and the Postbank. Why should I pay for a current account, if there are very good fee-free providers? The most beautiful day of this year was the 29th of September 2016, on which the DKB published the new conditions for the coming years. The accounts definitely remains free of charge also in the future and additionally, the foreign transaction fee is cancelled. A request that we continuously made! For our readers, we have summarized and explained the new conditions here. 2. The DKB does not badger me! In all the years – and our frequent readers know: I am customer of the DKB since 2004 – I did not get a single advertising letter nor a single advertising e-mail. I perceive this as very nice, because it does not depredate my time and attention. On the part of the Comdirect, an otherwise very good bank, I regularly receive mail with offerings of products that I do not use yet. Also from other providers, from the Deutsche Bank to Barclaycard. I have saved a lot of time with the DKB, from opening the mail, determining the advertising, eliminating it due to the personal data (shredding machine) and then throwing it into the paper waste. 3. The DKB is there for me, when I need it! I perceive this point as especially comforting in a bank. I can call the bank on any day at any time and ask for information or induce things. It sometimes was the case that the hotline was too busy. Calling a little later is in any case better, than waiting for the opening and availability hours of other banks. Especially in the secondary time, it worked great with the DKB by phone. There were also call-backs on weekends. Likewise, I received e-mail answers on weekends. If you need an information urgently or are in an emergency situation, you really will appreciate it, if your bank is there for you. Especially, if you love to travel just like me. The DKB offers its customers an emergency service. If the DKB Visa Card is defect or lost, you can get an emergency card and/or emergency cash within 48 hours. This service is of Euros 150 to 180 value, however, free of charge for us active DKB-customers! Of course, this is interesting, if one likes to travel by plane. Also, if I pay the flight trip by transfer, I need the credit card to book the accomodation and the rental car. At both positions, usually a security deposit is required. If I am using the overdraft facility more than usual due to the accomodation and rental car, then the security deposit is booked on top. The deposit is fortunately only a reservation of the money amount. This is unblocked after finishing the rental period. If one only has a credit card on credit base, then one must transfer this amount to the card and have it available. As I have a comfortably huge credit line on the Visa Card granted by the DKB due to my salary payments, I do not have to worry about expensive journeys and high security deposits. Up to this date, I did not even reach the upper limit of the credit line. I like to use the credit line, because it is interest-free until the change of the month! Moreover, the maximum possible credit line is the three-times amount of the monthly salary transfer, but not more than Euros 15,000. Just like with the DKB-overdraft facility. From time to time, I have transferred the salary payments to another account. However, this has not harmed the once granted credit line. This remained the same as high all the time. For new customers that do not have a salary transfer to the DKB, this information could be important: the overdraft facility can be increased at will with deposits to the current account and a subsequent rebooking to the credit card account. Who permanently needs a higher credit line than the DKB is willing to grant, one can get additionally a Barclaycard. Here you can read, how I trained my credit line to Euros 9,500 there. Take a look at the comments too. They contain very valuable tips and show that some readers reached even higher amounts. In the meantime, I often pay with the card. This is true. However, some things I do not want to pay by card or it is not possible. A good cash supply is important for me. Most often, I get the cash through the ATMs of banks on the spot. Inserting theDKB Visa Card, entering the PIN, choosing the amount, waiting for the rattling and done, the money is here. Very easy and comfortable for me. As you may have seen on our blog, we have also tested other cash supply possibilities. The last contribution deals with the feature Cash im Shop through a generated barcode. A great possibility for people, where banks on site have configurated their ATMs, so that they bother the customers of direct banks. But why? The ATM-providers get on average Euros 1.75 per withdrawal. This fee is paid by the DKB for me. Therefore, I use this meaningfully and do not withdraw too small amounts. Incidentally, one can withdraw cash as a DKB customer also at most Shell petrol stations, as well as at different supermarkets using the Girocard. Who needs higher amounts in cash, can let them be send through a money courier (subject to charge) for amounts up to Euros 10,000. I have tried this service as a preparation for a journey with money bills in another currency. Here the article of that subject: Money service for journeys offered by the DKB. Cheaper is, of course, to withdraw cash in the country of journey at the ATM. This is namely completely free of charge on the part of the DKB (no withdrawal fee, no foreign transaction fee). 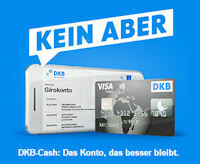 In all the years I have made hundreds of cash withdrawals within Germany and abroad with the DKB Visa Card. The costs have always been borne by the bank for me – costs up to Euros 5.95 per withdrawals at other banks! – I am thankful to the DKB for this! The DKB Visa Card is my every day companion on my trips abroad. What do you like at the DKB? A survey among our frequent readers revealed that many also have a DKB-account. I am thrilled to know from you, which points you particularly appreciate at the DKB and how you use the account. Did you know that one can subscribe to our Youtube-channel with only 2 clicks? I would like to know if you give loan for foreign people because I’m buying an appartment in berlin. Yes, DKB does real estate financing as well. They have once called themselves „House Bank on the Internet“ („Hausbank im Internet“). They treat foreign citizens like German citizens, if they live in Germany and have an unlimited residence permit. Credits to people living abroad are not granted by this bank, not even when the property is located in Germany.